cw618 ... considering the spokesperson for the Sheriff's office failed to mention the possibility of Dylan not making it to his father's home ... could it be that authorities have determined the location of the 9:37 PM texting. Does your cell tower info provide any indication? Thanks. I wish investigators would release the location of Dylan's last text at 9:37 PM. When I read the words of Dylan's mother and investigators again ... it makes sense that Dylan never set foot in his father's house on the evening of November 18th. If Mark Redwine has wifi (I think he probably does), there is also the possibility that texts may have been sent from another device. Dylan had an Ipod (said to be missing with the rest of his things) and it has also been reported that an Ipod was taken during the search of Mark Redwine's home. I don't know the make of either of them or if they were the ones capable of sending text messages (Touch), just wanted you to be aware of the possibility if you weren't already. IIRC, there is a text message that has been mentioned by the family or those close to them that was sent at about 8:36 iirc. (I think there may be some question as to if Dylan was actually the one that sent it? No one really talks about it much, I've just picked up bits and pieces here and there about it.) I'm also assuming that this information came from the phone records for Dylan since his mom would have access to those records. If there was another text sent at 9:37 and it's not on those records, I think it could have been sent by another device? From my understanding if texts are sent by an Ipod (touch), it is done through a wifi connection and the record is through the sender's email? An Ipod and two vehicles among other items were taken by investigators during a search of Mark Redwine's home. 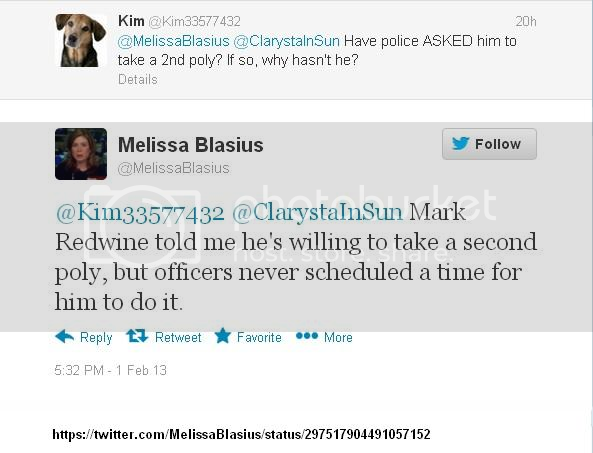 James Lyn Have the police indicated if they believe Dylan was ever at Mark's house after he arrived for this visit? I took this screen shot later in the day, glad I did since the whole FB post has either been hidden or deleted! Why am I not surprised about that? Regarding the 9:37 p.m. text. First comment on Thursday, January 31, 2013. Lori Cahoon Corlis That article states the last text went 'out' at 9:37. Who was that to and what did it say ... Or is that a secret? I thought his last txt out was 8 something and that the last incoming (and unanswered) txt was at 9:30ish. Thursday at 4:50pm via mobile · 2..
Find Missing Dylan Redwine The later text was from another device, possibly an Ipod, and we've never been told where or who received that message. Mason Forrest Vigil I grew up with Cory and knowing everything from 1999 I assume mark had something to do with it. Cory a and Elaine both loved Dylan with everything, but mark always was the guy not to like. I think to myself why mark would do it n I came to a conclusion. He wasn't a good father or husband and the only way he can feed that pain was hurtin his son by vanishing him also hurtin his ex wife and his son Cory. But who am I? Love you Dylan come home! Mason Forrest Vigil Who else is their blame? Mark last one to see him physically and touch him right? People said they seen him walking but their no proof mark could have easily placed his stuff in areas and cleaned up evidence. It's crazy how mark gettin away I feel so easy n so long. It'll catch up to him. It's on gods hands. ITA about the odd wording cw618. I've watched the video many times, still waiting for the uncut versions too...wonder what the hold up is on that. This one struck a chord in me too...imo just the way he tells it; it's more about Mark than Dylan. In the reporter's words Mark describes a loving bond with his youngest son. "He wanted to go to Boston to see the Red Sox and people thought I was crazy because I was willing to drive that far because those are memories of a lifetime that nobody can take away." Keep in mind this trip of a lifetime was in August. AFTER Elaine and Dylan had moved to Colorado Springs. The timing of it is highly suspect imo. If Mark had been seeing Dylan on a regular basis, it might not be as suspect imo; but from all indications Mark had not taken advantage of his visitation with Dylan on a regular basis for at least the past three years before his disappearance. After Elaine filed the motion to move and Mark was disputing it, he saw him for this trip in August, and then over the Labor Day weekend (Labor Day was September 3rd), remember this was BEFORE the final ruling for the relocation. The final ruling on the relocation was Sept 21st or 25th from what has been stated by Cory Redwine and Elaine's friend Katt. In the first 9 Wants to Know report, it was stated that there was sealed testimony from Dylan in both the September and November court hearings. It has been stated by one of Dylan's aunt's iirc (from what Dylan told them before he left for the Thanksgiving visit) that Mark had no communication with Dylan between court and his arrival in Durango on November 18th. Dylan disappeared Nov. 19, the morning after he flew in to spend Thanksgiving break with his father. Dylan and his mother had moved to the Colorado Springs area in July where she had primary custody of her son following a long and bitter divorce battle. Elaine signed over the house that she and Dylan were living in to Mark on July 9, 2012. Mark lost, the court ruled in Elaine's favor. (No idea about the difference in Sept 21 and Sept 25, maybe when the documents were actually filed for the record? Hearing on the 21st, record of the order filed on the 25th? Or maybe one of them just had the date wrong?) The 21st was on a Friday, the 25th on Tuesday of the next week. Cory Redwine See the best part that I forgot to add is that close to around $50,000 has been donated which is so amazing and awesome! but not one dime came from Mark not one flyer has been posted by him except the one on his door hidden by fire wood! He has the money to hire the best private investigator money can buy but chooses to save that in case he's got to pony up and lawyer up! He doesn't understand actions speak louder than words and with him not talking his actions scream guilty to me! I KNOW YOU did this MARK ALLEN REDWINE the only person you have fooled is yourself the weight only gets heavier the longer you think and try to outrun your mistakes your not half smart as you thought you were on sep 21 when you started this plan! Dylan arrives in Durango on November 18th for a court ordered Thanksgiving visit with Mark, and vanished. 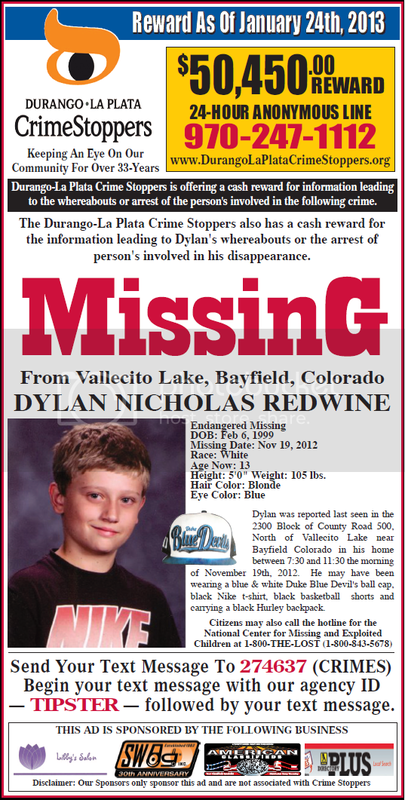 13-year-old Dylan Redwine vanished from southwestern Colorado on November 19th, 2012. His disappearance is a mystery. This is the uncut interview 9Wants to Know did with his mom, Elaine. Please excuse the zooms, sidetrack conversations, etc. We did not originally intend to make the entire interview public, but we changed our mind due to the tremendous interest in the case. I've watched it a couple times now. It just made me more mad if that's even possible! Sorry, still not buying his BS. If I hadn't followed this case as closely, or been around people like him before; he might have had a chance of making me doubt he's involved. So emotional when I wouldn't have expected it, so calm when I would have expected some emotion...jmo. Definitely took his jabs at Elaine as much as possible. I could argue with so many of the things he said with what is known, and with common sense; but what's the use!? Not one question about the polygraph, or if he was going to take another polygraph. How many times did he say he wanted them to look closely at him? And she never thought to ask? She asked him about that after the interview when VIEWERS repeatedly asked about it. At least they did get him talking. He's had plenty of time to think about what he'd say! This is the picture that you can in the video, hanging above the couch. It's the only picture of Dylan (or anyone else) that I could see in the video. 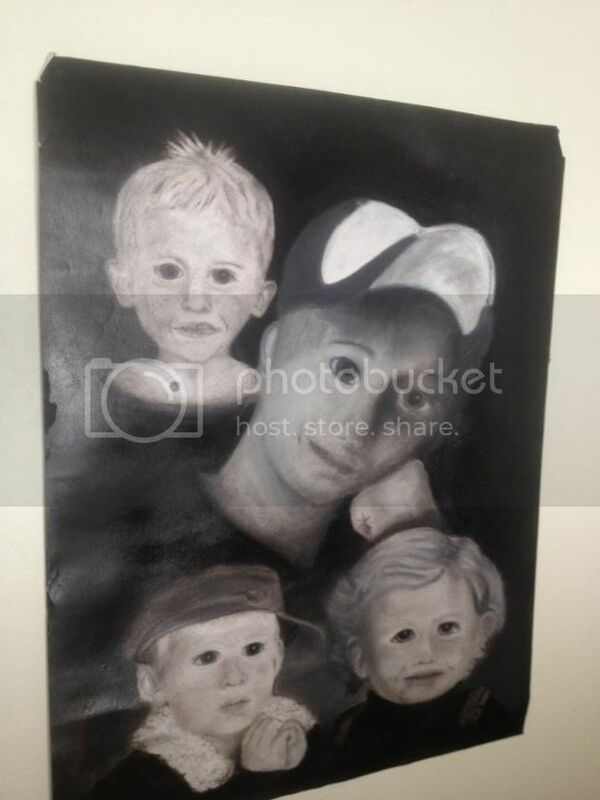 This is the picture that you can see in the video, hanging above the couch. It's the only picture of Dylan (or anyone else) that I could see in the video. Calling Mark Redwine It's my understanding the Mr. Redwine has not been home since that rally in front of his house. Does anyone know if that is true? Someone that lives up at the lake said there have been no tire marks in his driveway. Katt Hawkins I can attest that Mark has not been home. Drove up there 2 days ago and there are indeed no tire prints in the drive. Gone for 2 weeks? ?